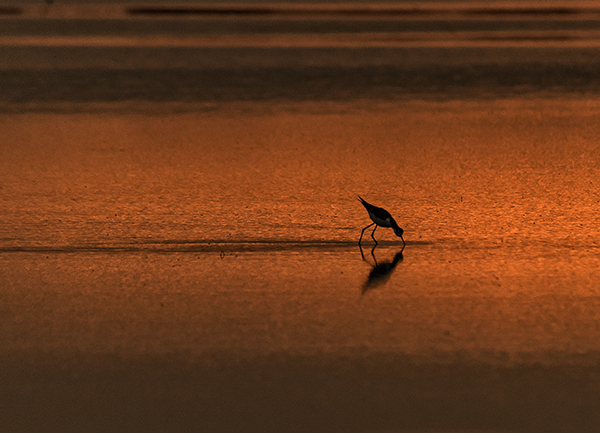 This solitary Black-necked Stilt was an early bird hunting in the reflection of sunrise at Prime Hook National Wildlife Refuge. 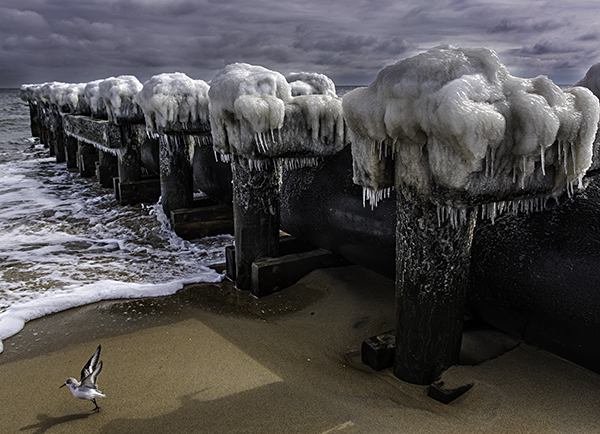 Icicles form under icy mushroom caps on pilings in Rehoboth yesterday. 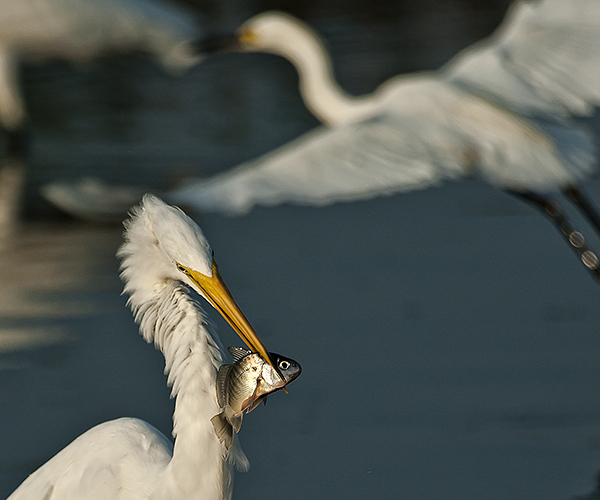 This cold snap is providing many interesting photo ops of subjects we usually relate to hot summer fun at the coast. I’m loving these ops, personally. 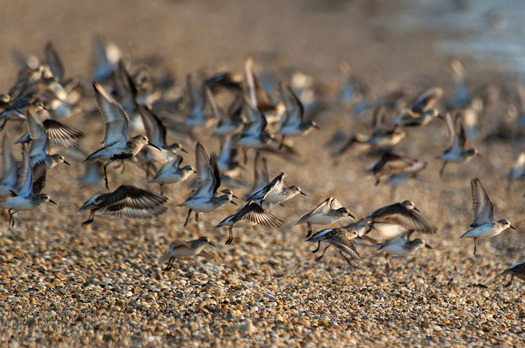 This little sanderling seemed oblivious to the cols and snow and just went about its daily beach foraging. 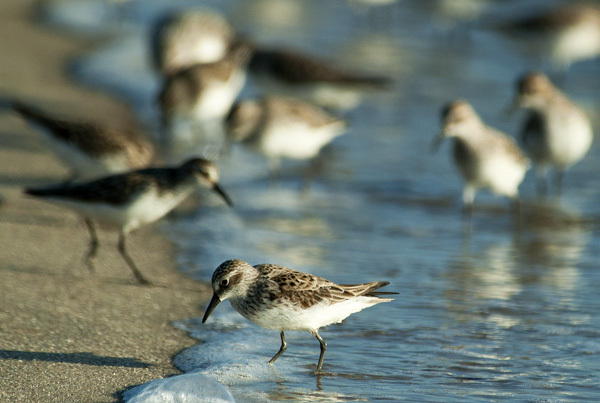 Shorebirds dodge splashing waves at Indian River Inlet. 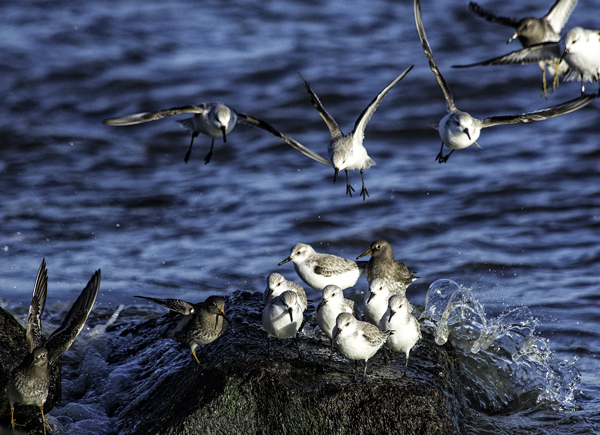 Sanderlings and Purple sandpipers picked over the cold jetty rocks today at low tide at Indian River Inlet. 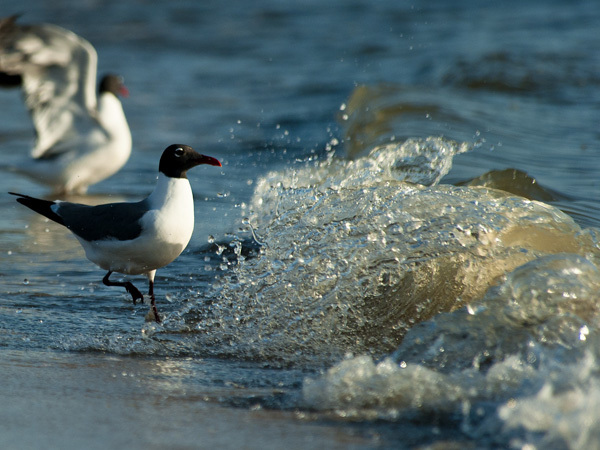 The occasional small splash from a wave caused wings to raise and small jumps to be made to avoid a cold drenching. 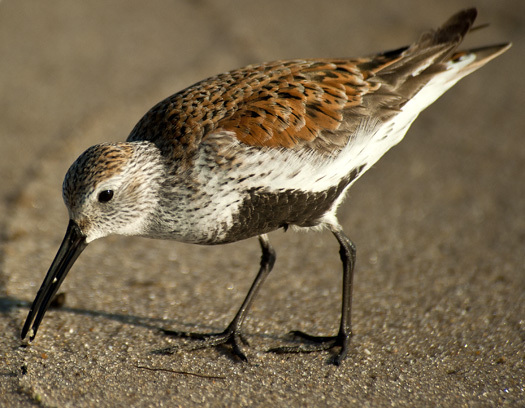 This Dunlin was sifting through the beach sand this morning with its bill in search of horseshoe crab eggs, a seemingly difficult task since the eggs are about the size of a sand grain. But these birds are very good at their craft noted by the two eggs it holds in its bill with very little sand mixed in. Could so easily have been green eggs and sand! 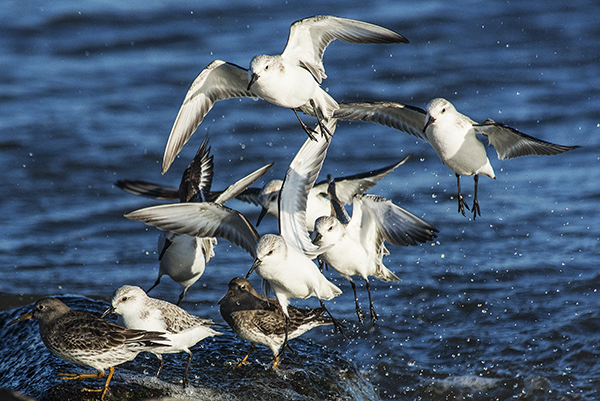 Shorebirds soar together at a sound or movement unheard or seen by me. 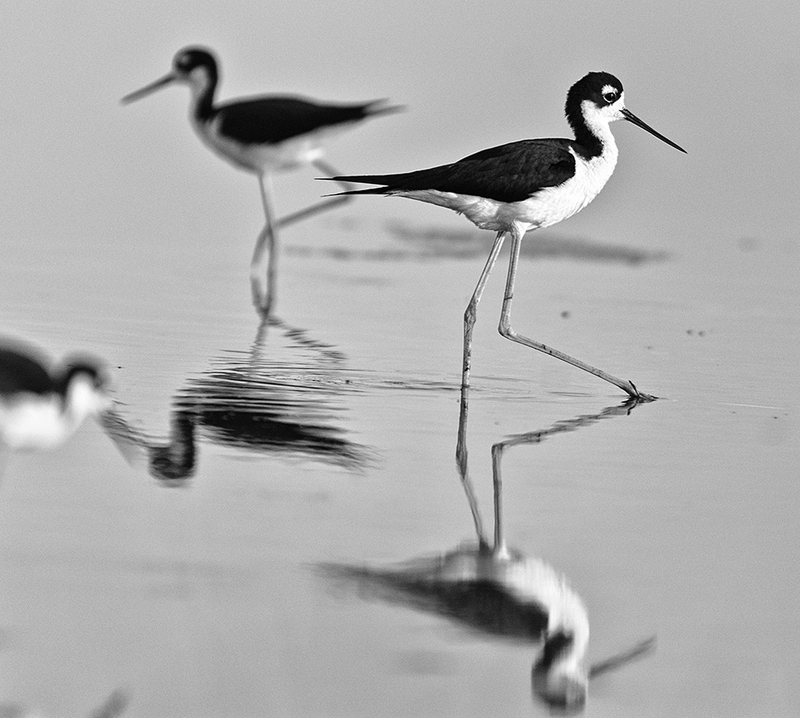 They do this quite often as the poke around in the gravelly sand in search of horseshoe crab eggs on Slaughter Beach.